It can be extremely annoying when you’re looking away from your screen, typing away, then look to realize it’s all in CAPS. You accidentally hit the Caps Lock Key…here is how to make it beep when you hit it so you have a warning. 1. To make the Caps Lock key beep and alert you if it’s accidentally hit in Vista or Windows 7, click on Start >> Control Panel. 2. In Control Panel set the view to show Large Icons, then click Ease of Access Center. 3. When the Make your computer easier to use screen comes up, you might be surprised when the computer starts talking to you. If you want to turn that off, uncheck Always read this section aloud. Then under the Explore all settings list click Make the keyboard easier to use. 4. Then in the next screen scroll down and check Turn on Toggle Keys – hear a tone when you press CAPS LOCK, NUM LOCK, or SCROLL LOCK. Then click OK and close out of Control Panel. 1. The process is essentially the same in XP but things are named and laid out differently. Click on Start >> Control Panel. 2. When Control Panel opens make sure you’re in Classic View and click on Accessibility Options. 3. 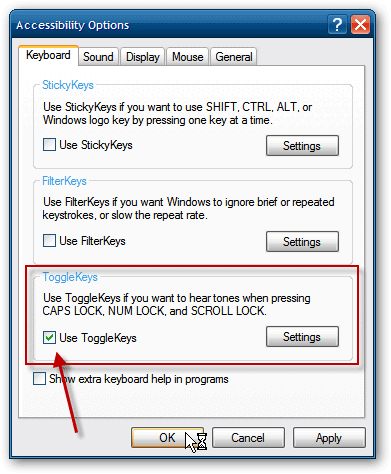 In the Accessibility Options window, make sure you’re under the Keyboard tab, then check Use ToggleKeys. Click OK then close out of Control Panel. That’s it! Now any time you hit the Caps Lock key you will hear it beep. This trick can be very helpful when you’re busy and accidentally hit Caps Lock.